Here’s my review on each of the pairings on the show so far. Daniel and Sarah: Okay, so Sarah and Daniel are actually kind of cute, right? What he said to her at the rose ceremony was so sweet, and I loved the little date he set up for her. Daniel is hilarious and ridiculous, so it leaves Sarah intrigued to explore that relationship rather than Christian. Evan and Carly: Poor Carly. Evan is the only person who in interested in her, and she seems interested until they kiss. Her commentary is super funny, but I do feel bad for Evan. When I don’t feel bad for Evan is when he goes for Amanda. She’s sucking face with Josh, and he thinks he’s going to swoop in. Emily and Jared: I hate how the show treats the twins. I’m going to keep mentioning it because it drives me nuts that the show keeps objectifying those two. They’re both individuals and they have their own personality. I love Emily. She’s got a great personality and she’s hilarious. The scene where they kiss was cute, and I really liked drunk Emily too. Izzy and Vinny: Not sure what happened with the Sarah stuff, but these two were rock solid in the last episode. Lace and Grant: I like how Grant went over and told Lace he’d give her a chance after the Chad debacle. They also seem rock solid. Haley and Brandon: Brandon seems so boring, and Carly seemed to be interested, but he opts for Haley. 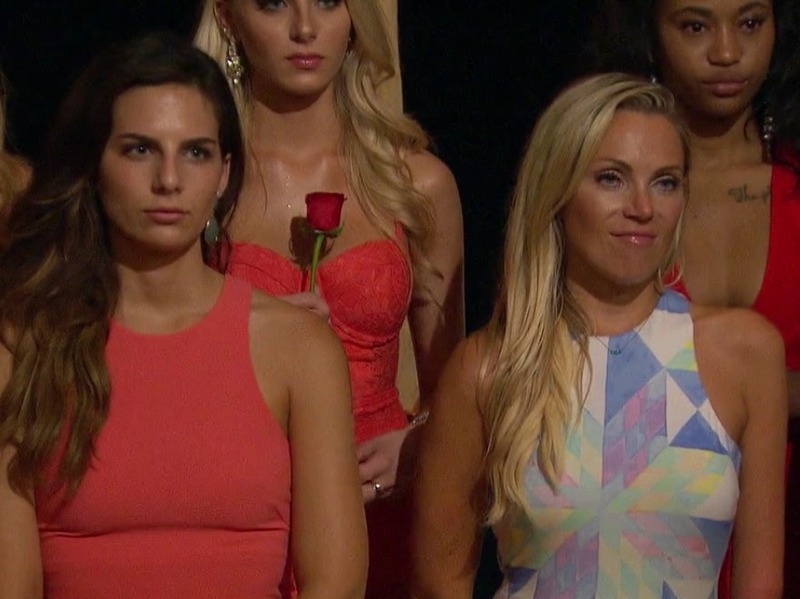 Emily and Haley switch places, and it makes for great television. I love Sarah’s dress here. She wore a lot of pastels and I loved how pretty this long dress was. I love this romper. It’s super romantic and pretty. I also love the green color on Haley. This bathing suit top is really pretty. The tassels are super boho, along with the print. It’s also cute and works as a top to wear throughout the day. This romper is super easygoing, and I love the leaf print on this piece.